If you are studying Medieval History in your homeschool, you are going to love this new exclusive freebie from Homeschool Giveaways! 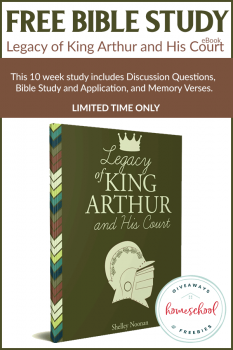 Carrie is offering a Legacy of King Arthur and His Court FREE Bible Companion! This resource is a free Bible study companion to the book the Legacy of King Arthur and his Court. It is a 10-week Bible Study that includes discussion questions, Bible study applications, and even Bible memory verses. You can work with your child in this Bible study companion, and it’s perfect for children age 9-14. This limited time freebie ends on 3/1/19! Quick! Grab this freebie before 3/1/19!